Viruses are the most abundant biological agents and comprise the majority of the biodiversity on Earth [1-3]. However, understanding the population biology and dynamics of viral communities in the environment is difficult because their hosts (predominantly microbes) are unknown and cannot be grown in culture. Furthermore, the study of viral diversity is hampered by the lack of a universally conserved gene across all viral species, analogous to rDNA genes in cellular organisms. Metagenomic shotgun sequence analysis of viral communities helps to alleviate these constraints and is currently the most widely used approach to study the biodiversity of viral populations isolated directly from the environment. Currently, there are a number of publicly available bioinformatics tools for the taxonomic (Ribosomal Database Project(RDP) ,Greengenes ,MEGAN , pplacer ) and functional (IMG/M , CAMERA , MG-RAST ) analysis of metagenomes. While IMG/M facilitates the functional analysis of pre-selected metagenomic data, it does not support the input and analysis of external user data. CAMERA allows for the construction of customized workflows for the analysis of external metagenomic data including functional annotation using RAMMCAP based on PFAM, TIGRFAM and COGs. MG-RAST is an alternative web-resource that performs metabolic reconstructions using SEED subsystems  and builds automated phylogenetic profiles of metagenomic data provided by the scientific community. While MG-RAST has been used for the functional annotation of multiple viral metagenomes , it is not ideal for the characterization of viral metagenomic data since functional classification is solely dependent on similarity to FIGfams , protein families developed from manually curated bacterial and archaeal proteins. Another limitation of this tool is that it does not search for conserved protein domains or motifs that could provide additional clues about the functional roles of genes present in metagenomic samples. The VMGAP requires a protein multi fasta file as input and the local installation of several open source programs, packages and public databases. 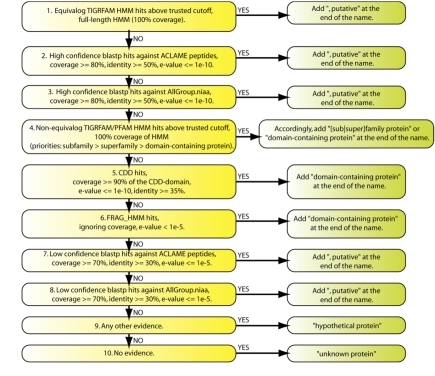 The required software and packages are HMMER , NCBI-toolkit (blast searches ), SignalP (signal peptide prediction ) and TMHMM [19,20] and PRIAM (Ecnumber prediction ) . Among the public databases searched by the pipeline are GenBank NRDB, GenBank environmental databases ENV_NT and ENV_NR, UniProtDB , OMNIOMEDB , PFAM  and TIGRFAM  HMMDBs, ACLAME protein and HMMDBs ,GenBank CDDDB  and pfam2gomappingsDB . Each lane contains the annotation for a single predicted peptide. Multiple values within a field are separated by the symbol “||”. While MG-RAST is capable of providing meaningful taxonomic and functional annotation of microbial metagenomes, it is limited in its capacity to annotate viral metagenomes due to its inherent dependence of FIGfams. In order to quantitatively assess the utility of VMGAP for the functional annotation of viral metagenomic data, we ran an identical set of ~300,000 peptide sequences from a marine viral metagenomic library or their respective coding ORFs through the VMGAP and MG-RAST respectively. Analysis of the results showed that the VMGAP could assign functions to almost 16% more sequences compared to MG-RAST (names other than hypothetical or unknown, Figure 3). More specifically, when looking for viral-like enzymatic functions (e.g. integrase, endonuclease, DNA polymerase) or names describing viral-like structural functions (e.g. capsid, tail, neck, envelope), the VMGAP assigned almost 16,000 more viral-like names compared to MG-RAST. Of the sequences that received no functional names, ~72% contained some other evidence such as hits against environmental databases, PFAM domains or signal peptides while only 29% of such sequences are reported in MG-RAST (Figure3). A more in-depth analysis showed that the increase in assigned VMGAP-associated functional terms was due to the incorporation of databases that contain viral-specific annotation, such as ACLAME. 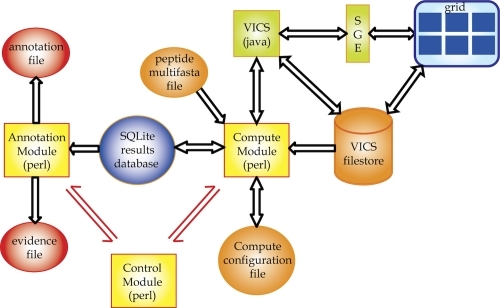 Since VMGAP also performs additional analyses such as HMM, CDD and environmental DB searches as well as MeGO/GO and EC number assignments, it provides a more comprehensive repertoire of evidence types that may facilitate the discovery of novel viral functions as well as comparative analyses of metagenomic datasets. Comparative analysis of the functional annotation performance for viral libraries of the VMGAP compared with MG-RAST. 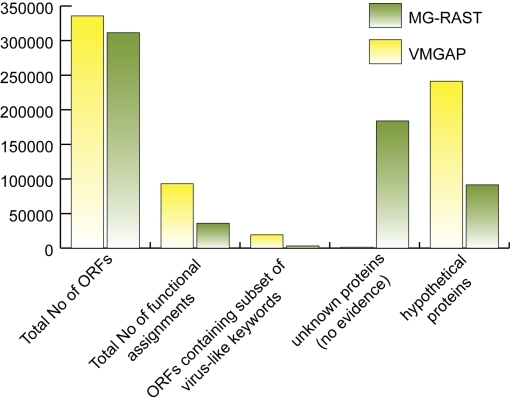 Total number of functional assignments represents the amount of peptides from the viral library that gets a name other than “hypothetical protein” or “unknown” (VMGAP) or that does not have a significant hit against any FIGfam (MG-RAST). Unknown proteins are those that do not receive any evidence as described in Figure 1 (VMGAP) or that do not hit any FIGfams (MG-RAST). The following are examples of virus-like keywords used in this analysis: integrase, terminase, polymerase, recombinase, (endo|exo) nuclease, phage, viral, capsid, envelope, filament, and basal plate. Regarding the VMGAP implementation, the generation and storage of results into a relational sqlite database presents many advantages over working with flat files. The sqlite database allows the pipeline to monitor the status of each process launched on the grid and, in case of failure, restart the pipeline from the point that it crashed. Also, it makes it easier to query results, integrate different data types when generating summary reports, and share this information since all the analysis data (i.e. programs, parameters, cutoffs) and their results are stored in a single sqlite file. The storage of data in an sqlite database, however, might present some loading speed challenges when the data volume is very large and the speed of the storage device where the database resides is not fast enough (e.g. 7,200 RPM SATA drives). At JCVI, sqlite databases typically reside in 15,000 RPM SAS drives, with bandwidths of ~ 500 MB/sec. For slower systems, we recommend avoiding the usage of these databases and rather parse the results directly from the raw outputs of the analyses to generate the annotation and evidence files.